Story: From director Jon Amiel (The Singing Detective, Entrapment) and writer John Collee (Master and Commander: The Far Side of the World) comes Creation. 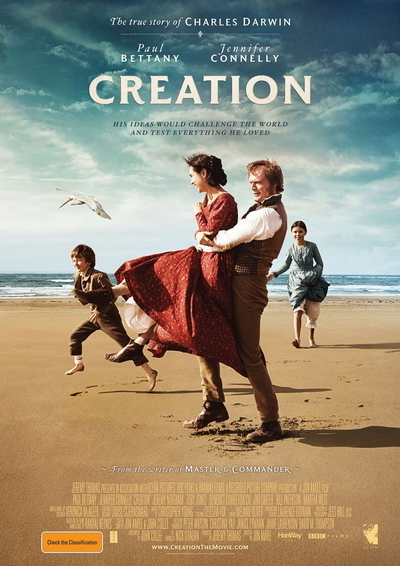 A psychological, heart-wrenching love story starring Paul Bettany (A Beautiful Mind, Master and Commander: The Far Side of the World) as Charles Darwin, the film is based on "Annie's Box," a biography penned by Darwin's great-great-grandson Randal Keynes using personal letters and diaries of the Darwin family. We take a unique and inside look at Darwin, his family and his love for his deeply religious wife, played by Jennifer Connelly (A Beautiful Mind, Requiem for a Dream), as, torn between faith and science, Darwin struggles to finish his legendary book "On the Origin of Species," which goes on to become the foundation for evolutionary biology.